Where do you find ideas? How do you turn those ideas into a full storyline, and then a script? Script Storylining for Film & TV is a writing workshop designed to help you go from an idea to a full outline for a film or TV script. Based around James Moran's writing process, he'll take you through the actual techniques he uses to come up with ideas and work them up into a full storyline for a script, showing you how you can apply them to your own work. This tried and tested method works for James every time he uses it, and makes the process as fast and fun as possible. James regularly gives talks, seminars and workshops at events around the world, and has developed this workshop over several years. It is specifically designed to help work up an idea from a simple, one sentence concept, to a full story that can sustain an entire film or TV episode. It is what James uses to write his own work, and he will use examples from his own produced scripts to demonstrate this, discussing how he gets through the first draft without stopping. He has been a guest speaker at the Met Film School, the National Film and Television School, film & TV conventions, keynote speaker at the Swanwick Writers' Summer School, and has delivered this workshop at YouTube, FrightFest, Dublin WebFest, and GeekyCon USA. 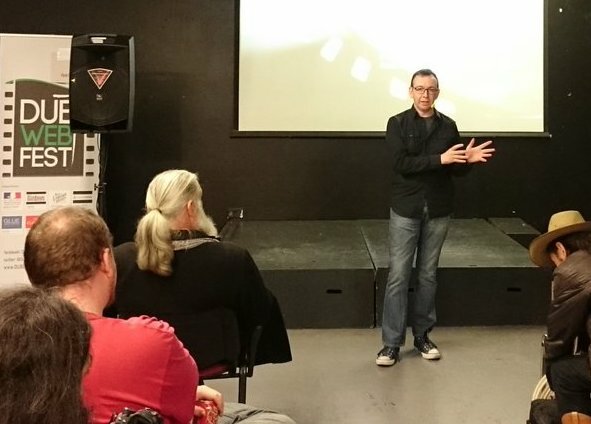 James’ writing workshop at FrightFest 2016 was a terrific success. A brilliantly crafted and presented session. He is a very inspiring person and his passion, knowledge. experience, humour and authenticity really motivated the audience. It is easy to WANT to write a screenplay but James makes it easier to actually go and DO it. James ran a fantastic Horror Writing Workshop for Script Yorkshire. Fun and informative, we left not only with a group outline for “Kinder Egg the Movie” but with lots of ideas and insight into not just how horror scripts work - but how all scripts work. James was also very generous about sharing his own writing process with the group and I certainly find that my own process of turning ideas into stories has freed up following James' unique story-structuring methods. The first of these new workshops will be run later this year in central London on a Saturday, lasting approximately 4 hours. Due to the nature of the workshop, there will be minimum number requirements for it to run, so if you would like to be one of the attendees, please register your interest using the form below. If you have different workshop needs and would like a bespoke solution, or if you'd like a workshop to be held somewhere local to you, please contact James to discuss your needs.